I use 3 main types of shoe construction. The type of construction affects the cost of the finished product due to the materials and time taken. Probably one of the oldest methods of shoe construction and still used today. The shoe upper is made and sole cut out and trimmed to fit the appropriate last. Then the holes for attaching the upper to the sole are made in the sole. The sole is then attached to the last upside down. The upper is then wet and put onto the last inside out, stretched and secured in place, this is called lasting. Then waxed thread is used to stitch the upper to the sole. Then the wet shoe is turned in the right way, no easy task with some shoe and boot patterns. The shoe is then put back onto the last until dry. Once dry any other pieces of the shoe like the sock, or liner, is then added to complete the shoe. This is probably the most complex of the 3 methods. As with the turn shoe upper is made and closed (sewn together). Then the in-sole cut out and trimmed to fit the appropriate last. The sole is then attached to the last up the right way. The upper is then wetted and lasted up. A strip of leather is cut about 1/2" wide and is called a welt. This is stitched on through the upper and into the insole with waxed thread. The next stage is to cut the sole and soak it. 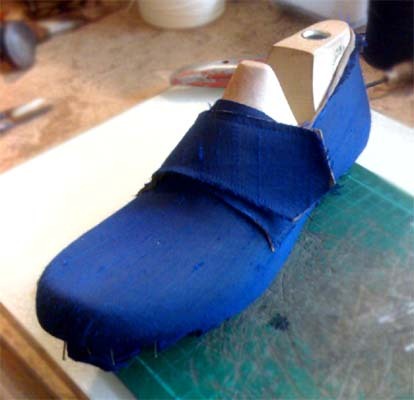 Once pliable it is attached to the bottom of the shoe and hammered to compress it. The sole is trimmed to be the right size for the shoe. A groove is cut in the sole and holes punched in the groove right through the sole and welt. The sole is sewn onto the rest of the shoe with waxed thread again. Before drying the sole is smoothed. When dry the heel is attached and the sole edges, including the heel, are sanded to a smooth finish and painted. All that is left is to fit the sock and the shoe is finished. Probably the quickest and most modern construction method. As with the previous two methods the upper is made and closed and soaked. 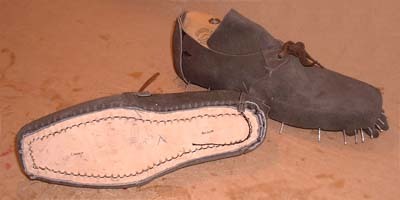 The insole, like the welted shoe, is made, trimmed and attached to the last. The wet upper is the lasted and left to dry. Once dry the upper is glued to the insole all the way around. The next stage is to cut the sole and soak it. Once fairly dry but still pliable it is glued to the bottom of the shoe and hammered to compress it. The sole is trimmed to be the right size for the shoe. Before drying the sole is smoothed. When dry the heel is attached and the sole edges, including the heel, are sanded to a smooth finish and painted. All that is left is to fit the sock and the shoe is finished.